As part of our growing line of High Power Absorptive Filters, Werlatone introduces the Model AF9255. This VHF, Low Pass Filter covers the 10-170 MHz band, and has an average power rating of 50 W CW. 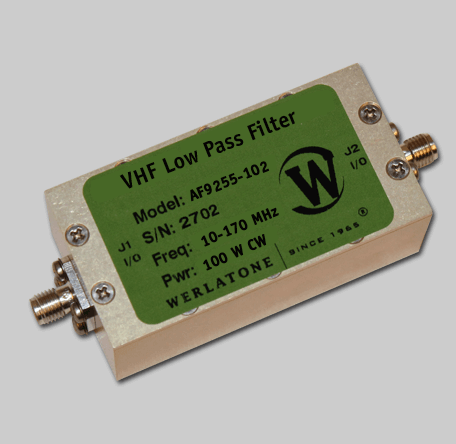 The AF9255 provides 50 dB minimum rejection from 300-1500 MHz. This compact design measures just 2.5 x 1.265 x 1", and is ideal for military & commercial applications. As part of our growing line of High Power Absorptive Filters, Werlatone introduces the Model AF9255. This VHF, Low Pass Filter covers the 10-170 MHz band, and has an average power rating of 50 W CW. The AF9255 provides 50 dB minimum rejection from 300-1500 MHz. This compact design measures just 2.5 x 1.265 x 1″, and is ideal for military & commercial applications.